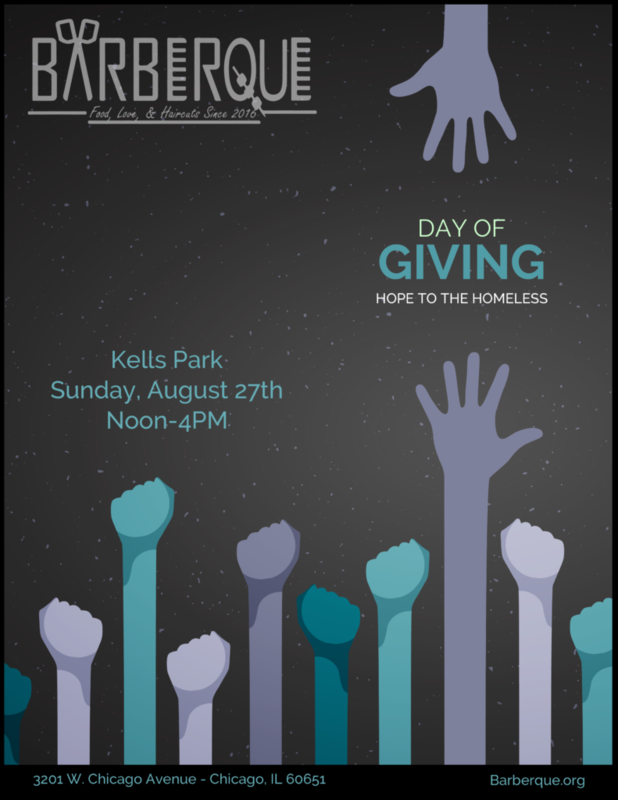 We are excited to announce that BarberQue will return to Kells Park in Chicago’s Humboldt Park neighborhood this year on August 27th, 2017! Like last year, the event will be held from noon to 4 p.m and will feature a free, family-style barbecue meal, free haircuts, and access to social service organizations. Unlike last year, this year’s event will feature more signage, more music, and hopefully less bees (but we can’t make any promises there). Additionally, we are changing things up a bit. Last year the toiletry and food grab bags were very popular – so much so, that we ran out around 1 PM. Because of that, and in an effort to make sure donations go to the people who need them the most, grab bags will be distributed during “outreach” sessions leading up to the event, instead of during the event itself. Along that line, we will be doing a lot MORE outreach this year. And, in response to many requests for other ways to get involved, there will be volunteer opportunities leading up to BarberQue during which we will sweep neighborhoods, passing out flyers and talking to people (sign up to volunteer here). Finally, the clothing drive last year was WILDLY popular – we gave away more than 2000 items! So, we are going to do it again this year (hopefully as big or bigger). Clean out your closets people! With one year under our belts, we now know that throwing this event costs us about $5000 – if we do it on a shoe string. Obviously, the more we raise the more we can give. Last year we gave 70+ haircuts and fed 300+ people. Multiple people found housing directly as a result of BarberQue. That could not have happened without your support. So, this is us asking you to support us again this year. Let’s make BarberQue 2017 even better than than last year. P.S. Click here to donate – you know you want to. One Response to "Save The Date: BarberQue 2017"